In 1836, a small band of Methodists dedicated themselves to founding a college which would one day become one of the nation's premier institutions of higher learning, research and healthcare-Emory. Today, the 1836 Society honors the legacy of those founders by recognizing individuals whose dedication will strengthen Emory for generations to come. The generosity of 1836 Society members is evident throughout Emory-it has erected buildings, endowed professorships, funded vital research and expanded excellence in healthcare. 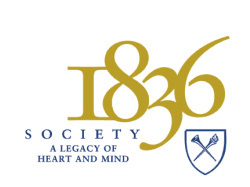 We invite you to become a member of the 1836 Society by making a planned gift of any amount to the school or program at Emory that is important to you. The expression of your individual commitment and values will have a real impact on Emory's continued excellence and its ability to expand its vision in the future. For information, contact Emory Office of Gift Planning at 404.727.8875 or giftplanning@emory.edu.